S. Janaki, whose name is synonymous with music, has been singing for more than five decades. She has been in the news for the past few days following the announcement of the Padma awards by the Central Government. She has decided not to accept the Padma Bhushan for which she has been chosen this year. When the award was announced, the legend was in Kerala visiting the holy shrine of Guruvayoor. In a telephonic interview, she stated the reasons for declining it. I felt I have achieved a lot and therefore deserve much more than a Padma Bhushan. After saying no to it, I have been receiving non-stop calls from friends and fans who have appreciated my stand. I felt I should have been recognised earlier; I can’t help thinking the South is constantly being neglected. ‘Bharat Ratna’ is an award that should be given to anyone who has rendered yeoman service to the country. The South too has abundant talent that deserves to be honoured. Maestro M.S. Viswanathan or Illaiyaraja has not been given the Bharat Ratna nor even Sivaji Ganesan. The Government, I feel, is neglecting the South. It’s a small group that decides who must get the Bharat Ratna or the Padma awards. Even people from the South who have got national recognition so far such as director Bapu and playback singer P. Leela deserve much more. Each is a legend in his/her own field. That’s why I felt someone had to do something about it. I started my career around the age of 15 or 16 (1957) and have been singing without a break. I have sung some wonderful songs for children, teenage girls, elderly women and in fact even boys and men. I have captured a range of emotions through my songs. After singing some 40,000 songs in 17 languages and getting four national and several state awards, I felt what they have given me now, after being in the field for 55 years, is too little. I think I deserve more, don’t I? 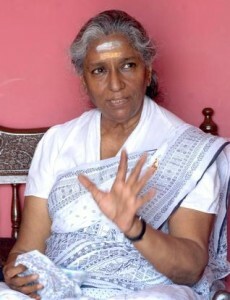 P. Leela was given a Padma award posthumously. Why can’t the Government recognise people’s contribution when they are alive? I was given the Best Singer Award by former President of India Rajendra Prasad for the song I sang in an All India Radio competition when I was a kid. More awards followed and I was happy to receive them all. But the doctorate I got from the Mysore University is really special to me. Apparently that university rarely makes such a gesture.